grandma's cookie jar: I Have a Winner & Another Give-Away in Two Days! I'm very happy to say Jennifer Mays is the winner of the book; Rufus Goes to Sea. (You'll find my full review at this link.) Thank you Jennifer for reading grandma's cookie jar (please email me your address by May 11, 2015 so I can have it sent to you - lyndagcj@gmail.com) and thank you Sterling Children's Books for sending one for me to review and for making another available for me to give away! I'm also happy to say in two days, on May 6, 2015 I'm giving away one Wiggimals Pig. 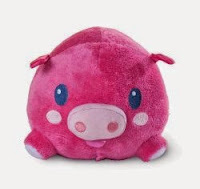 This little pig is a fun toy for little ones - you will find all the details for the give-away at this link - but the important thing is you still have time to enter the drawing for this give-away - who knows???!!! Maybe you will win! More Fun Ideas for A Summer to Remember! just for fun - 32 Ideas for Backyard Fun! The Very Best Kind of Gifts! Summer Fun at grandma's - Treasure Rocks!!! Summer Fun - Ice Eggs with a Surprise Inside! More than 14 Giveaways to Go - Enter to Win! My Mother's Day Gift From My Grandsons! Special Give-Away for Cottonmouth and the End! just for fun - Summer Musical Fun! Harmonica Boy, Sprinklers & the "Relocater"